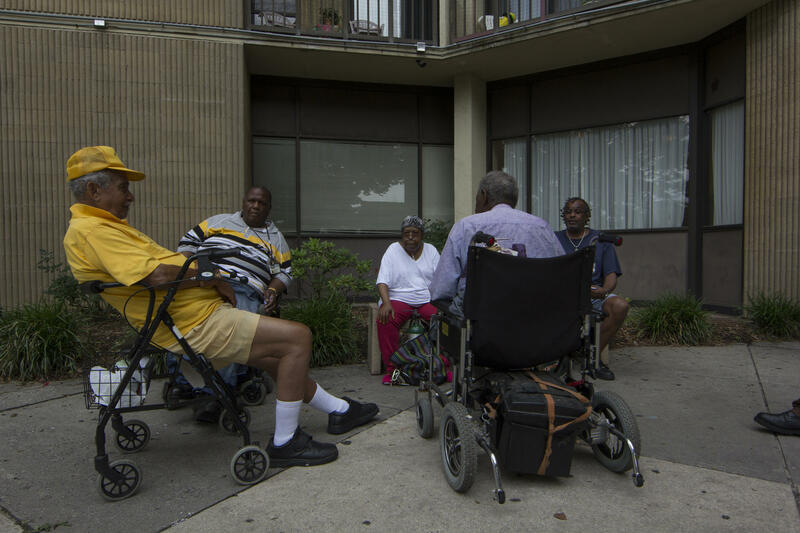 A group of friends sit in front of Bel Park Towers in Park Heights. Many of the folks in this picture spent a lot of time telling me about their concerns and the conditions of their building. The frustrations that have convulsed Baltimore this spring have roots in police practices, yes – but also much deeper roots, roots that stretch back over a century, in a history of various government policies that made racial segregation official. Take public housing, which has existed in the United States for nearly eight decades. As in many other places, government housing assistance in Baltimore has been a central safety net for the poor. But it also has perpetuated generational poverty and racial segregation. In the last twenty years, new approaches have been tried to replace government-owned high-rises – for example, housing vouchers or rent subsidies in privately owned buildings. Now there’s another new idea, and Baltimore is one of the cities trying it out. It’s called RAD, or Rental Assistance Demonstration. RAD’s proponents say it will bring a long-overdue investment from private developers into under-funded public housing in poor neighborhoods. But critics say it will let private businesses control a federal program that should remain just that– publicly funded. Jonna McKone has been following Baltimore’s public housing changes for the past year. She brings us this story on public housing’s future and its past. Jonna McKone reported this story with an Equal Voice Journalism Fellowship from the Marguerite Casey Foundation and the Journalism Center on Children and Families. Thanks to former Maryland Morning intern Brandon Block who helped with this story.